The Union and Empire Base Ball Clubs of St. Louis played a match game yesterday afternoon in the beautiful Base Ball Park, situated near the Fair Grounds on Grand avenue. The rain in the forenoon, though wetting the ground seriously, did not act unfavorably for the play, and at 3 o'clock when all were met for the game, the sun was shining brightly and everything promised well. Early during the game, too, the sky became overcast, with clouds, rendering the air cool and very pleasant - just the thing most desired by the players. The game was between picked nines of each club, and was the first of a match of best 2 of 3 for the championship. After the selection of Mr. Wm. McGowen, of the Atlantics, as umpire, the game commenced, the Union winning the choice of positions and taking the field. Union - Cabanne out on 1 B; Smith, splendid bat to left field and made 3 B; Wolff, fine bat to left field, making 3 B and sending Smith home; Strong, good bat to centre field, sending Wolff home, stole 2d and 3d and went home on a bad catch; Lucas out on ball fielded by short stop to 1 B; Greenleaf 1 B on ball to centre field and stole 2d; Carr out on foul by O'Connell, leaving Greenleaf on 3 B. Score on the Innings - 3 to nothing for Union. Empire - O'Connell 1 B on called balls, stole 2d and 3d, and quietly waiting his chance, stole home; Fitzgibbons had his first given to him, stole 2d, made 3d on passed ball; Shockey out on 3 strikes; Welch got his first on call balls, as also Heep, thus placing three men on bases; Wirth, by sending foul to B, which was fielded by Smith put out Fitzgibbon and Welch, ending inning with a score of 1. Union - Easton 1st B on calls, stole 2nd and 3d and brought home by Turner, who himself was out on 1st base; Cabanne 1st base by a swift grounder to short stop, which, though well fielded by Barron, was badly thrown; Smith 1st base by a sky ball to right field muffed by Murray, bringing Cabanne home; Wolff offered Heep, at right field, a splendid fly which the latter muffed, letting in Smith; Strong 1st base on a swift ball to centre field, which brought in Wolff, 2d base on bad ball, and stole home; Lucas made 1st base; Greenleaf out on foul; Carr out on a ground ball well fielded by Barron to 1st base, leaving Lucas on 3d - giving Unions 5 runs. Score - 8 to 1 for Unions. Empire. - Heep 1st base on calls, and 2d and 3d by bad throws; Wirth, grounder over 3d base, giving him 1st base, stole 2d, took 3d on pass ball, and home on bad throw; Spalding 1st base on calls; Barron swift ball to centre field, giving him 1st base and Spalding home, made 2d on pass ball, and brought home by Murray sending long ball to centre field, which gave him 3d base, from which he stole home; O'Connell out on foul bound; Fitzgibbon captured at 1st base by a well fielded ball from Greenleaf from right field; Shockey 1st base on ball to right field well fielded by Greenleaf, stole 2d, and made home by bad throw of Turner; Heep out on three strikes. 6 runs. Score - 7 to 8 in favor of Union. Empire - Heep 1st base on ground ball, stole 2d, where he was put out, having started on a foul; Wirth 1st base on good stroke to centre field; Spalding made 3d base on a fine hit to right field, muffed by Strong; Barron line ball to centre field, made 3d base, bringing Spalding home; Murray, low ball to L. field, made 2d base, stole 3d and got home; Barron also making home; O'Connell captured at 1 B; Fitzgibbons 1 B on a muff by Wolf; Shockey out on foul bound, leaving Fitzgibbons on 2d, adding 4 runs to Empire score. 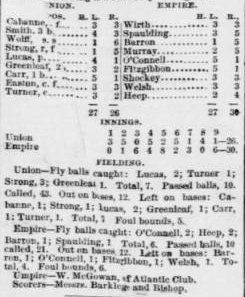 Union - Smith 1 B on a ball well fielded by Barron; Wolff grounded ball to C F, giving him his 1 B, bringing Smith home, and eventually stealing home himself; Strong out on foul fly well taken by O'Connell; Lucas 2d B on swift ball to L F, and brought home by Greenleaf, who made 2d B on a grounder to R F, and in turn brought home by splendid grounder of Carr, who made 2d B and stole 3; Easton 1 B on low ball to L F, giving Carr his run; Turner splendid long-field ball, which brought in Carr, gave himself 2 B, stole 3 B, where he was left by Cabanne being caught out on fly by Barron - 5 runs. Score - 11 to 13 in favor of Union. Empire - Welch 1 B on calls; Heep 1 B on straight ball to R F, bringing Welch home; Wirth 1 B on grounder over 3 B, which was badly fielded by Smith; Spalding heavy bat to R F, bringing Heep home and Wirth to 2d B; Barron line ball to C F, taking Wirth home and Spalding to 3 B; Murray good hit to C F, adding 1 to Spalding's score, a bad throw from Lucas to 2 B, letting both Murray and Barron home; O'Connell out on foul bound by Turner; Fitzgibbons 1 B on call, stole 2, though near being caught by Easton and Carr; Shockey 1 B by fine bat to C F, bringing Fitzgibbons home, made 3d by bad throw, and stole home; Welch out on 3 strikes; Heep 1 B on ball to C F, making narrow escape at first, eventually caught between 2d and 3d by Wolff - 8 runs for Empire. Union - Smith out on foul bound by O'Connell; Wolff 1 B on swift ground ball to L.F.; Strong 1 B on bad muff by Murray, who missed a fine chance for double play, the only opportunity offered during the game; Lucas 1 B on bat to C.F., and makes 3d on bad balls, which also brought Wolff and Strong home; Greenleaf out on a difficult foul bound by O'Connell; Carr out at 1 B on well fielded ball by Barron - 2 runs on inning. Score - 15 to 19 in favor of Empire. Empire - Wirth out on beautiful fly caught [in right field]; Spalding suffered same...[illegible]...Fitzgibbon fell a victim to Wolff's fielding at 1 B, leaving O'Connel on 3d - 2 runs. Union - Easton out on 1 B by the sprightly fielding of Barron; Turner 1 B on line ball to C.F., stole 2d; Cabanne 2 B on fine hit to L.F., which carried Turner home; Smith, by straight ball to C.F., made 1 B, putting Cabanne and Turner home, and himself making 3 B on a muff; Wolff 2 B on swift grounder to R.F., Smith home, stole 3d; Strong 1 B on safe bat to L.F., stole 2d; Lucas out on splendid one-hand foul-bound catch by O'Connell; Greenleaf 1 B by centre fielder, giving Wolff his run and strong 3 B; Carr made strong hit to L.F., which Shockey failed to take, bringing Strong home and Greenleaf to 3 B, who immediately afterwards was captured between 3 B and home by Fitzgibbons - 5 runs for Union. Score, 20 to 21 in favor of Union. Empire - Shockey out on well-taken fly by Greenleaf; Welch got his first on calls, made 3d on bad balls and stole home; Heep 1 B on ball to C.F., and 3d by wild throw of Smith, run home on passed ball; Wirth out on foul bound by Lucas; Spalding 1 B on daisy cutter to R.F., stole 2d and got 3d on bad call; Barron out on ball well fielded by Smith to Carr - 3 runs. Unions - Carr out on ball to L.F., which was deftly sent by Spalding to Wirth; Easton out on fly by Spalding; Turner 1 B on a sky ball to L.F., which again slipped through Shockey's fingers, stole 2d and made home on a wild throw; Cabanne got 2 B on a ground ball to L.F.; Smith out on a splendid fly taken at R.F. by Heep, leaving Cabanne on 3 B, and only 1 run for the innings. Score, 24 to 21 in favor of Empires. Empire - Very short work, Murry, O'Connell and Fitzgibbons going out in 1, 2, 3 order (whitewash). Union - Wolff 2 B on a grounder to R.F. ; Strong, 2 B on safe ball over 3 B, bringing Wolff home; Lucas caught at 1 B; Greenleaf 1 B on swift ground ball to R.F. which was well stopped by Wirth, but not in time; Carr out on foul fly by O'Connell; Easton 3 B on long hit to L.F. and home on bad throw by Murray. Turner out at 1 B on well fielded by Spalding to Wirth who took it with one hand on a jump - 4 runs. Score 25 to 24 in favor of Unions. Empire - Shockey 1 B on straight ball to C.F., stole 3d; Welch 1 B on call; Heep 1 B on good left fielder, bringing Shockey home; Wirth 2 B on grounder over 3 B, taking Heep and Welch home; Spaulding caught out on long fly ball by Strong at R.F. ; Barron made his 2 B on a heavy bat to C.F., 3d on muff, which carried Wirth home; Murray 1 B on left fielded, giving Barron his run; O'Connell out at 1 B, ball fielded by Smith; Murray home; Fitzgibbon taken on fly by Strong, ending innings with 6 runs for Empires. Unions - Cabanne made 3 B on a beautiful sky ball to C.F. which Welch muffed; Smith out on foul bound by O'Connell; Wolff struck out; Strong 1 B on a left fielder, which was again muffed by Shockey, giving Cabanne his run; Lucas out at 1 B on ball nimbly fielded by Barron, ending the innings with 1 run, and giving the game to Empire by a score of 30 to 26. The game was closely contested, and was well played throughout. The batting was remarkably good, and much of the fielding excellent. A cordial spirit prevailed during the entire game, and, although the decision of the umpire were frequently the subject of criticism, deference and respect were accorded him. The game was decidedly the most interesting and best played that has transpired at any grounds in this neighborhood this season. It being the first game for the championship, due notice will be given of the subsequent game or games, as the case may be. -This was game one of the 1869 championship series between the Unions and the Empires and I'll post the other games as I make my way through the Republican's coverage of the season. -The Union Club were the two-time defending champions, having won in 1867 and 1868. Their victory in 1867 dethroned the Empires, who, essentially, had been the best club in St. Louis since at least 1861. The Empires were the self-declared Champions of the West in 1865 and the St. Louis (and, by extension, Missouri) champions in 1866. The 1867-1870 seasons were the highpoint of the Empire/Union rivalry, when two very good and very even clubs would battle for the St. Louis and Missouri championship. -This game is a perfect example of what baseball was like in the pioneer era. Lots of base-runners, lots of stolen bases, lots of muffs, lots of runs. Put the ball in play and run like hell. The game was all about base-running and defense. If you couldn't field the ball and keep guys off the bases, you were going to give up lots of runs. The main difference between good clubs like the Empires and Unions and the great Eastern clubs was that the Eastern clubs were consistently better defensively. Also, the Eastern clubs had better and swifter pitchers, which also helped in keeping guys off base. -Check out John O'Connell leading off the second inning for the Empires. He walked, stole second, stole third and then stole home. He scored a run without the offense ever having put the ball in play. That's amazing and wonderful baseball. I've seen guys walk, steal second, steal third and then come home on a ground-out or a fly-out but I've never seen a run scored without the ball ever being hit. As a guy who grew up watching Whitey Herzog's Cardinals, that's the kind of baseball I love.